French delivers custom-designed compression, lamination, transfer and vacuum molding solutions, engineered to meet your exact needs, whether it’s a stand-alone hydraulic press or a machine interfaced with automated material and mold handling equipment for unattended manufacturing. Our hydraulic presses can be designed with capacities ranging from 20 tons to 2,000 tons. Common sizes request include: 30 ton, 200 ton, 250 ton, 300 ton, 400 ton, 450 ton, 500 ton and 1000 ton. Choose either sideplate or column construction, C-frame or H-frame, upacting or downacting. Many tonnages and platen sizes are available. In addition to our own line of hydraulic presses, French offers presses engineered by TMP, A Division of French. French engineers draw from a century of experience to provide solutions for the manufacturing challenges of the 21st century. Contact French today to discuss how we can help you mold the 21st century with our custom hydraulic presses. Download our free hydraulic press guide filled with maintenance tips. French is ISO-certified and our floor standing hydraulic press models are renowned for their low deflection, delivering uniform molded parts that require less post handling, with fewer rejected parts. French custom hydraulic presses are typically engineered to deliver 0.001″ deflection per linear foot, but we can design systems to meet either tighter or larger deflection targets. Heavy-duty construction guarantees many years of reliable operation with minimum downtime. 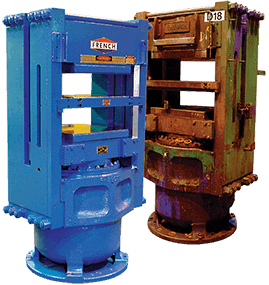 Many French hydraulic presses built in the 1940’s and 1950’s still perform reliably today. Aftermarket Sales provides a complete range of replacement parts for French and TMP hydraulic presses, as well as repair and re-manufacturing services for components. Knowledgeable factory customer service personnel provide expert application advice and fast, responsive support. Service technicians and engineers are available for in-plant maintenance, repairs or upgrades. 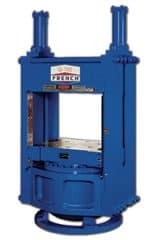 French offers a three-year limited warranty on new French hydraulic presses, which is three times longer than the industry standard. French’s Hydraulic Press Rebuild Sales Department offers a wide range of rebuild, retrofit and productivity improvement solutions for your existing hydraulic press. Services range from machining and partial refurbishments to complete rebuilds.